Many farmers who farm in hi-tech ways do not fully understand what hi-tech agriculture is all about. This is the opinion of experts. The experts say that if the farmers knew more, they could produce more food. Most successful hi-tech farming in Viet Nam happens in the Central Highlands province of Lam Dong. HÀ NỘI – Many farmers in the nation’s most advanced province in hi-tech agricultural production have a limited understanding what it actually means, experts say. This also limits the province’s ability to fully tap the potential for hi-tech agriculture, they add. With its considerable advantages in land and climate conditions, the Central Highlands province of Lâm Đồng is leading the country in developing hi-tech agricultural production. However the province lacks comprehensive “technology planning,” leaving its potential for higher productivity and better product quality untapped, according to Nguyễn Trúc Bồng Sơn, director of the province’s Agriculture Extension Centre. The “hi-tech agriculture” term has only been understood properly by policy makers and researchers; most farmers are still confused about it. “Many farmers think as long as they grow flowers in a glass house they can call it hi-tech agriculture. No. Hi-tech agriculture requires a lot more than that, be it quality seedlings, cultivation technology, or human skills to attain high yielding, good quality produce,” he said. Sơn said that farmers in the province were pursuing different hi-tech production models without any official orientation from authorities or experts as long as they earned a good profit. Phạm Thị Cúc, owner of the Bạch Cúc Farm, grows vegetables using hydroculture, which she said she learnt from her peers. “I don’t know which method gives higher quality, but my friends said customers like it better, so I chose this model,” she said. Meanwhile, Nguyễn Văn Thành, chairman of the An Phú Đà Lạt Company, has been planting his crops on nutritious soil, applying fixed-bed technology. Nguyễn Văn Sơn, director of Lâm Đồng Province’s Agriculture and Rural Development Department, said that while farmers had their right to choose their cultivation method in a market economy, the lack of proper oversight by the State could prove damaging in the long run. “Relevant State agencies need to properly analyse the pros and cons of each cultivation model,” he said. Đoàn Văn Việt, Chairman of the province’s People’s Committee, acknowledged at a recent meeting that a weakness in the province’s agriculture sector was that it lacked proper technology planning. 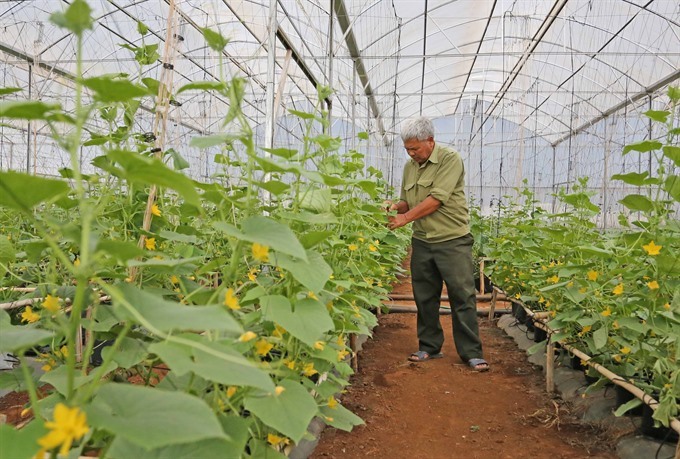 “ After many years applying hi-tech agriculture, Đà Lạt City still doesn’t have a post-harvest processing factory or a trade and evaluation centre,” he said. “These are the biggest hindrances that keep Đà Lạt from having agriculture products of higher quality. The city needs to foster post-harvest technology in the coming time,” he added. Phạm S, Vice Chairman of Lâm Đồng, said the province had included technology planning in its agriculture production planning. Lâm Đồng Province currently has more than 43,000ha dedicated to hi-tech agriculture, equal to 16.4 per cent of cultivable land. Of this, 11,900ha is for vegetables, 2,400ha for flowers, 11,300ha for coffee, 2,500ha for tea and 300ha for specialty trees. The province recently started co-operating with the Japan International Co-operation Agency (JICA) on a promising comprehensive agriculture development project with multiple approaches. The overall aim of the project is to turn the province and the Central Highlands region into a high-value agriculture hub in Southeast Asia. Many farmers in the nation’s most advanced province in hi-tech agricultural production have a limited understanding what it actually means, experts say. To have a limited understanding of something means to understand a certain amount but no more. To tap potential means to make the most of a possibility. Advantages are things that are in your favour. Comprehensive means thorough, including lots of details about lots of things that matter to technology planning. To attain something means to get it, often through hard work and effort. Hydroculture is a way of farming that involves planting things in liquid or gravel rather than soil. It is also called hydroponics. Your peers are people who are doing what you are doing and are probably around your age. Nutritious means full of the good things found in food that make it possible for living things to grow. Relevant state agencies are those that do work in the field of hi-tech agriculture. To analyse means to take a good look at a study or a report of something and work out trends. Pros are things that are in favour of a model; cons are things that are against it. After many years applying hi-tech agriculture, Đà Lạt City still doesn’t have a post-harvest processing factory or a trade and evaluation centre. Post-harvest means after a harvest. “These are the biggest hindrances that keep Đà Lạt from having agriculture products of higher quality,” he said. Hindrances are things that get in the way of progress. JICA has sent experts to counsel and help Lâm Đồng access new production and post harvest technologies, as well as achieve vertical and horizontal integration for production, consumption and export. 1. A type of crop grown in glass houses. 2. A country where the An Phú Đà Lạt Company has business partners. 3. An abbreviation for hectares, the unit in which the size of land is measured. 4. The sale of something to a buyer in another country. 5. The type of crop grown by Phạm Thị Cúc. 1. Flowers; 2. Canada; 3. ha; 4. Export; 5. Vegetables.